The Bay Phantom is out to prove that evil had better stay out of the American south! Mobile, Alabama—1920’s. Prohibition is in full force and the “separate but equal” policy is undermining Civil Rights. Joseph Perrone comes from an old south family, but not old south viewpoints. 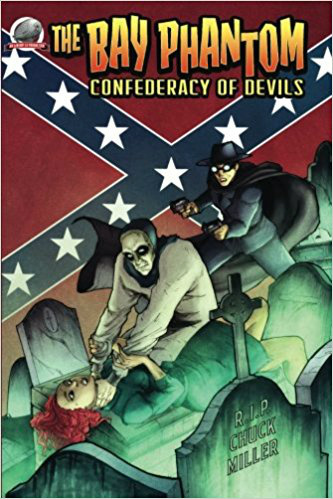 Backed up by the lovely Mirabelle Darcy, a young black woman with the 9th highest IQ in the world; Perrone battles the forces of evil as the masked Bay Phantom. Mirabelle manages to rise above the people who would hold her back and has corresponded with men of science such as Einstein and Freud; also men of philosophy such as Mahatma Ghandi. Torn by her natural talents and feelings and the prejudice of 1920’s Mobile, Mirabelle deals with more than creating gadgets for the Bay Phantom—something that may tear her apart. The area is very volatile, and the powerful Carter family has been running things their way for a long time. They are very much old south; their family was slave holders and they hate the so called “carpetbaggers” from the north with their rights for black people. A new election for mayor is going on and this year the Caters’ handpicked candidate might have a real battle. The KKK, silent for years has suddenly come out of hiding with a blue-robed Grand Wizard whose forces are battling the Black Embalmer—or are they? The answer doesn’t seem to be all that easy. Another shadow stalks the night, a powerful death-dealing werewolf! This story is quite a trip and with Chuck Miller’s usual aplomb has many threads that seem disconnected at first, then form a comprehensive bolt of tapestry, then leaves lingering threads still on the loom. There are some secrets of the novels that one can reasonably figure out but which are never really stated. The fully explored controversy of being black in the south is what it is, people. No matter how much we would like to rewrite history, it happened. The language and ideas are unfortunately true to the time and place. I am certain that Chuck Miller doesn’t personally have these views and I admire his willingness to write about history how it happened, not how we wish it happened.